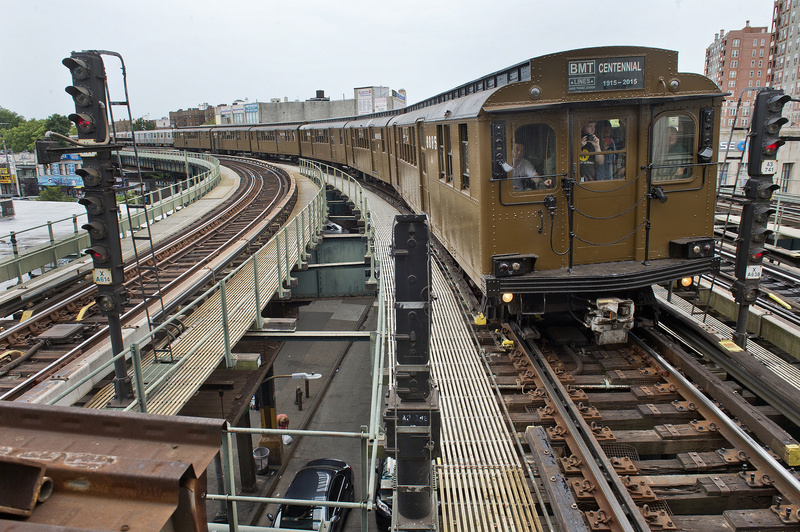 Ride the rails in historic style this Father’s Day weekend by hopping on and off six different types of vintage train cars, including the oldest train cars in the Transit Museum fleet – the BRT Brooklyn Union Elevated cars dating back to 1904! The Parade of Trains shuttle rides are free with subway entrance and will run continuously to and from the Brighton Beach station B/Q platforms from 11am to 4pm on both Saturday, June 16th and Sunday, June 17th. BRT Brooklyn Union Elevated Cars (1903 – 1969): These cars, the oldest in the Transit Museum’s vintage fleet, were ordered in 1903 and 1907 by the BRT for its subsidiary, the Brooklyn Union Elevated Railroad. Typical of the first motorized cars ordered after the BRT electrified its elevated lines in 1900, the car design featured a lightweight wooden body mounted on steel underframes. Known informally as “gate cars,” passengers entered and exited through open-air vestibules at the front and back of each car and a conductor manually opened and closed metal gates and rang a ceiling-mounted bell when passengers were safely on board to signal the motorman to proceed. BRT/BMT Standards (1914 – 1969): Modeled after Boston Elevated Railway cars, the Standards measure 67 feet long and 10 feet wide and contain 78 seats with an additional 14 drop-down auxiliary seats. The standing capacity of 182 people helped address the chronic overcrowding of the early subway years. The Standards introduced destination roll signs, larger windows, and brighter lighting. They were designed more along the lines of a suburban railroad car, with a maximum seating philosophy, and even included drop seats for off-peak use. BMT D-Type Triplex (1925 – 1965): Ordered in 1924 as transit operating companies were moving away from wooden cars in favor of steel, these three-car articulated units with shared trucks allowed passengers to walk from one car to another through an enclosed passageway. Each Triplex is 137 feet long and seats 160 passengers, the equivalent of 2 Standard cars in size and capacity. The Triplex represented the height of transit modernity with soundproofing, illuminated signs displaying route destinations, and rattan seating. Known informally as the “Train of Many Metals,” this train features three different types of vintage cars manufactured by the American Car and Foundry Company and the St. Louis Car Company between 1948 and 1967, including: the R10 (1948 – 1995), the first cars to be manufactured with an LAHT steel construction; the R16 (1955 – 1987), an improved model of the R10 featuring electrically operated door motors rather than the R10’s air-powered doors; and the R38 (1966 – 2009), the first subway car fleet to have air conditioning installed upon arrival. Please note: Passengers will only be able to get on and off the trains at the Brighton Beach (B/Q) station. Vintage trains will be traveling in both directions, making a short round trip to Ocean Parkway and a longer round trip to Kings Highway. Car equipment is subject to change.